This study guide contains some of the most crucial information that you definitely need to know as a Respiratory Therapy student. On top of that, it will carry over for when you’re working and seeing your own patients as a Respiratory Therapist as well. So take your time and go through each practice questions until you truly learn and understand the information. Are you ready to get started? 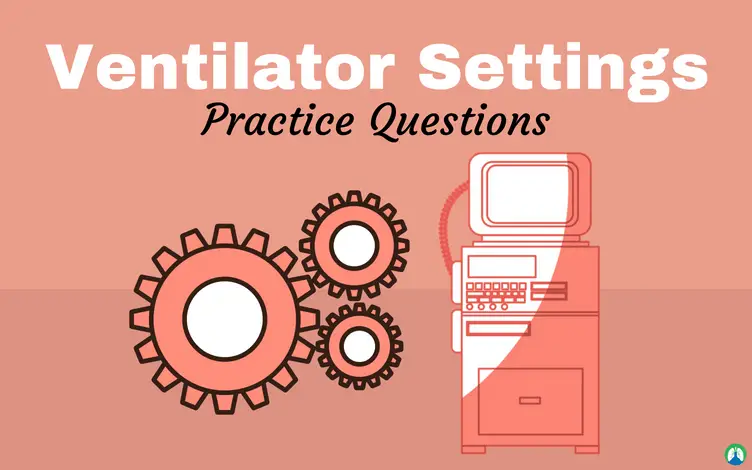 Ventilator Settings Definition: these are the input settings within the mechanical ventilator that instructs the machine how to perform in order to meet the need of a patient. 1. What setting is sometimes difficult for a patient to initiate a breath? 2. When will your high-pressure alarm go off and what is the normal setting for it? The alarm will sound if delivered tidal volume is greater than what you have set. The normal is 200 mL above the set tidal volume. 3. If you have a patient with chest trauma, what would you want his set flow to be above and what would you do to minimize the chances of barotrauma? The flow is set above 60 LPM. This patient needs lower volumes and a higher respiratory rate to minimize the chances of barotrauma. 4. What setting is easier for a patient to initiate a breath? 5. What flow pattern is used in pressure mode and what type of patients typically like this pattern? 6. If you have a patient with a set tidal volume of 600 mL but they are getting 850 mL, what would you adjust and why? You would need to decrease the pressure because the normal tidal volume is 250 mL above the set tidal volume. 7. What are the normal ranges for flow and pressure? Flow: 1-5 LPM, and Pressure: -1 to -5 cmH2O. 8. What would be settings for a normal post-operative patient be? Mode: SIMV, Tidal volume: 10-12 ml/kg, Rate: 10-12 bpm, i-Time: 1 sec, Flow: 40-60 LPM, PEEP: 5 CWP, FiO2: start an 100% and wean to keep their saturation >90%. 9. If you had a patient come in with a closed head injury what mode would you choose for this patient? Volume-controlled ventilation. Don’t use PEEP if the patient has high intracranial pressure. 10. What would be the limiting mechanism in aa SIMV pressure mode? 11. You have a patient admitted with a COPD exacerbation. Which mode would you choose? 12. A COPD patient is admitted and is receiving pressure control. What flow patterns would you choose? 13. What is the normal range for pressure sensitivity? The normal range is -1 to -5 cm H2O. 14. What type of ventilation would we use for normal lungs when other systems are shutting down? 15. For a patient with a CHF exacerbation, when would you NOT want to use volume ventilation? We would not want to use volume ventilation if the PIP is high, also we would want to consider using NIV first unless it is contraindicated. 16. If there is a leak in the patient circuit, which alarm would be going off? It is the setting for how the patient initiates a breath. 18. What is the normal high minute ventilation alarm? 10 L above the resting minute ventilation. 19. What mode of ventilation would you use for an ARDS patient? 20. What mode would you use for a closed head injury patient if there are no lung injuries? 21. What type of flow pattern would you see when using Volume Control? 22. What I-time would you use for a patient with a CHF exacerbation? You would want to use an I-time of 1-1.5 seconds. The reason we want a longer I-time is to use the pressure as a way to decrease the edema associated with their CHF exacerbation. 23. You have a patient who was found unconscious and you do not have any other information about the patient. What would the initial ventilator settings need to be? Mode: Volume-controlled, Tidal volume: 8-10 ml/Kg, Respiratory Rate: 8-12 bpm, I-time: 1 second, PEEP: 5 cmH2O, and FiO2: 100%. 24. Your patient’s ventilator is alarming a high-pressure high-alert alarm. What are the specific causes of this alarm? Coughing, kinking in the circuit or ET tube, secretions, decreased compliance, increased Raw, mucous plugging. 25. What would the normal flow be for a post-op hip surgery patient? 26. A patient presents to the ER after an MVA. He potentially has an increased ICP and needs to be placed on the ventilator. What mode would you select for this patient? 27. What are the two most common flow patterns? 28. What is the purpose of permissive hypercapnia? To decrease PIP and the likelihood of causing barotrauma. 29. What is the term for when a COPD patient needs to be mechanically ventilated while they also have respiratory failure? 30. What mode should you set a patient that has chest damage from an MVA? You would set him on pressure ventilation mode. 31. What are the levels of alarms during mechanical ventilation? Level 1: Immediately life-threatening (includes the failure of electrical power, exhalation valve, or timing). There can be excessive or no gas delivery to the patient. The remaining 2 levels are potentially life-threatening and non-life threatening. 32. What alarm cannot be silenced if gas is critical to the ventilator operation? 33. What is permissive hypercapnia? The process of allowing the PaCO2 to rise slightly in order to give small tidal volumes and a higher respiratory rate in order to decrease the chance of barotrauma. 34. What are some considerations for patients with closed head injuries? You should try to minimize noise, time in the room, coughing, and suctioning. 35. What alarm cannot be silenced? 36. A child comes in ER with an acute asthma attack and needs to be ventilated. What form of ventilation would you place him on? 37. If you are in VC and the high-pressure alarm is going off, what is possibly the problem? The patient’s lungs have decreased in compliance, causing an increase in PIP. 38. Why do we allow for bigger tidal volumes for neuromusclular diseases? It allows for the patient to meet their “air hunger” needs. 39. What is a reason for permissive hypercapnia and which type of patient do we use this for? Permissive ventilation allows for a decrease in PIP which decreases the chance for barotrauma. The tidal volume is smaller but we increase the respiratory rate to keep the same minute ventilation. ARDS patients can benefit from this. 40. If we add flow to the mechanical ventilator, what setting might we have to change? We might have to change our trigger from flow to pressure. 41. What are the two methods of setting a trigger? 42. Permissive hypercapnia is used to treat what disease process and what does it do? It is used to treat ARDS. It uses a high respiratory rate and a low tidal volume to prevent a high PIP (barotrauma). 43. Which type of trigger should be used when flow is being added to the circuit, like with a nebulizer? 44. The two types of triggers are what? What are their units of measure? Are they positive or negative values? Flow and Pressure. Flow is in ‘liters per minute; and is positive. Pressure is in cmH2o and is negative. 45. If a patient is female, 5’6 with normal lungs on volume control, what should her set tidal volume be? What should the high and low tidal volume alarms be set at? The tidal volume should be set at 590 mL-709 mL (10-12 mL/kg). The high tidal volume alarm is set at 200 mL above set tidal volume. The low tidal volume alarm is set at 200 mL below the set tidal volume. 46. Which flow patterns are the most common on a ventilator? Square- often seen in volume modes. Descending- often seen in pressure modes. 47. What alarm cannot be silenced due to safety concerns? 48. What type of ventilation do you want to use for a patient with an acute lung injury? 49. A patient is 70 inches tall and has ARDS. What type of ventilation and what tidal volume are you trying to achieve? Pressure ventilation, and trying to get a tidal volume of 780 mL but watch for high pressures. 49. What type of patient might we need to put into permissive hypercapnia? ARDS patients may require permissive hypercapnia if normal settings are not working. 49. A patient is being brought in to the ER after they were found lying in an alley. The patient is female and 5’4 and unresponsive, no other info is given at his time. The physician wants you to place her on a ventilator. What settings would you choose? You would want to start her volume control with a tidal volume range of 450-650 mL. 50. Why is using pressure to ventilate a patient with a closed head injury not recommended? Using pressure to ventilate will increase the ICP and may cause further damage to the patient. 51. What happens to a mechanically delivered breath if the high-pressure alarm is reached? The alarm will sound and the breath will be terminated. 52. Which alarm settings can be triggered by a leak? The low pressure, Low tidal volume, and Low minute ventilation. 53. If your patient has a tidal volume of 4-8 mL/kg and a respiratory rate of 15-25 bpm, what disease process does this patient probably have? They likely have ARDS. A smaller tidal volume and higher respiratory rate will decrease the chance of barotrauma and minimize PIP. 54. What is dynamic compliance? It is the amount of force needed to overcome airway resistance and inflate the lung with a volume. 55. What is static compliance? It is an inspiratory hold of air with a plateau pressure, giving the compliance of the lungs. 56. How will static and dynamic compliance of the lung change under the increase in airway resistance and stiffness? They will become less compliant. 57. What changes in the patient’s status can affect their compliance? The static compliance will decrease with resistance or increase with air-trapping. The dynamic compliance will decrease or become less with an obstruction. 58. What are the various factors used to trigger ventilator breaths? 59. What is the mean airway pressure? It is the pressure maintained in the airways in an entire respiratory cycle. 60. What blood gas value is the primary indicator of adequate ventilation? 61. What are the possible negative impacts of PEEP therapy? Barotrauma, decreased venous return, Qt and renal blood flow, increased WOB, PVR, ICP, deadspace, mean airway pressure. 62. What will be the result of an increased Raw or a decrease in compliance on a volume-cycled ventilator? The volume stays and the pressure changes. 63. What will be the result of an increase in Raw or a decrease in compliance on a pressure, time-cycled ventilator? Pressure, time stays the same as the volume decreases. Less minute ventilation, then the patient could become hypercapnic. 64. What is the normal HME % humidity? 65. What is the normal heated wick % humidity? 66. What is the normal high-pressure alarm setting? 10 above the patient’s set PIP. 67. What is the standard high rate alarm setting? 68. What is the standard low volume alarm setting on assist control and SIMV ventilation? 10-15 below the set tidal volume. 69. What is the standard low minute ventilation alarm setting? 70. What is the typical apnea alarm setting? 71. What is the standard I:E alarm setting? The inspiratory time is greater than the expiratory time. 72. What are the various ways you can adjust I:E on a volume-cycled ventilator? Flow, I-Time, tidal volume, or even respiratory rate. 73. What is the highest PIP on a volume ventilator that can occur before possible damage? 74. What is the maximum setting that should be selected for the high respiratory rate alarm? 75. What FiO2 limit is considered dangerous in regards to possible oxygen toxicity? 76. What settings on a ventilator are used to increase or decrease the PaO2? 77. How does PEEP increase the blood oxygenation? It increases alveoli recruitment by allowing positive pressure at the end of expiration before inhalation, restoring a person’s functional residual capacity. 78. How can the inspiratory time improve blood oxygenation? It allows for a longer inhalation time, which provides a longer contact time for diffusion to take place. 79. What is the appropriate action for any ventilator problem that is not immediately identified and corrected? Remove from the ventilator and begin bagging (manually ventilating) the patient. 80. What ventilator changes could be made to correct respiratory acidosis? Increase the tidal volume or respiratory rate in order to blow off more CO2. Adjust the tidal volume first, but if the tidal volume is already in the ideal range, then adjust the respiratory rate. 81. What ventilator changes could be made to correct a respiratory alkalosis? Decrease the tidal volume or respiratory rate. 82. What changes could be made to correct a high PaO2? Decrease the FiO2 and/or I-Time. 83. What is the goal for the PaCO2 and pH when mechanically ventilating a COPD patient with chronic hypercapnea? The goal is to get them to their baseline because their PaCO2 and pH are usually always acidic. 84. What are the normal tidal volume ranges? 8-10 mL per kg or ideal body weight. 85. What factors are to be optimized before considering a patient for weaning off the ventilator? Make sure the problem that caused the respiratory failure is resolved (This is the primary reason.) Make sure their blood gases stable (PaCO2 should be at their baseline, PaO2 should be adequate on an FiO2 of 40% or less), their cardiac condition should be stable. Their respiratory mechanics should be stable. 86. Why would PSV be added to SIMV? PSV can be added to help “fine tune” incremental changes and maintain an adequate spontaneous tidal volume. 87. What is the most common setting for the initiation of apnea ventilation? 88. What techniques are used to monitor the possible cardiac effects from positive pressure ventilation? An arterial-line, continuous blood pressure monitor, Swan-Ganz catheter, etc. 89. What is the possible advantage of pressure control ventilation over volume control ventilation? It helps to prevent barotrauma. 90. What is the rationale for permissive hypercapnia? To prevent barotrauma; only let go of maintaining the CO2 for the sake of the lungs. 91. What is a positive pressure ventilator? A machine that creates a positive intrapulmonary pressure in which turns creates a pressure gradient between the patient’s lungs and the atmosphere. 92. What is the definition of a negative pressure ventilator? A machine that creates a negative extrathoracic pressure which creates a pressure gradient between the patient’s lungs and the atmosphere. 93. What is the pressure trigger? The patient generates an inspiratory effort that drops pressure in the system, therefore triggers the machine into inspiration. 94. What is a time trigger? The machine begins inspiration as a result of predetermined time. 95. What is a flow trigger? The patient generates an inspiratory effort that changes flow in the system, therefore triggers the machine into inspiration. 96. What are the basic settings for a flow trigger? 1-3 LPM (the lower the number, the easier it is for the patient to trigger the machine). 97. What is an advantage of a flow vs pressure trigger? Flow is more sensitive to the patient’s effort. 98. What is a pressure limit? It sets a maximum inspiratory pressure that can be delivered to the patient. Basically, it stops inspiration. 99. What is the pressure-limiting relief valve? It is basically the high-pressure alarm. It releases any pressure in the system by venting any volume remaining (it allows the volume to escape). 100. How does PEEP work? It works by increasing the FRC. On expiration, pressure is held at an elevated baseline above the atmospheric pressure. When used with ventilator, it is the same as PEEP except that the patient must be taking spontaneous breaths. Otherwise, it is used to treat sleep apnea when a CPAP machine is used. 102. What is a ventilator mode? It is the control that selects how the machine will deliver inspiration or create expiration. 103. What is the sensitivity (trigger)? It helps to determine the ease with which the patient can begin inspiration. 104. How does PEEP contribute in removing CO2? It doesn’t. PEEP only affects oxygenation, not ventilation. It is the pressure it takes to ventilate the lung, aka the peak airway pressure. 106. What is spontaneous breathing? Is is patient triggered modes where the patient determines their respiratory rate, inspiratory flow rate, and volume of breaths. 107. What basic parameters must be ordered on a ventilator? Volume, rate, mode, and the initial FiO2. So there you have it! 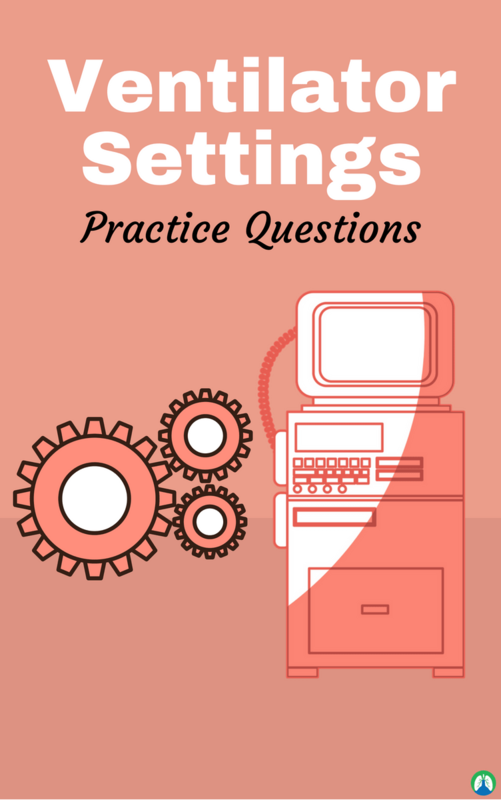 I truly hope that these ventilator settings practice questions were helpful for you. I’m confident that if you use this study guide properly (by going through the questions again and again), you can easily learn the information that is required for you to know and more. Thank you so much for reading and as always, breathe easy my friend.